On the Piccadilly Line today, rattling into London, I was about to settle into a book when my eye caught a poem where an advert should be. It was a beautiful and slow piece called Whalesong and is by Sophie Stephenson-Wright, one of three teenage poets who won a Poetry Society competition. 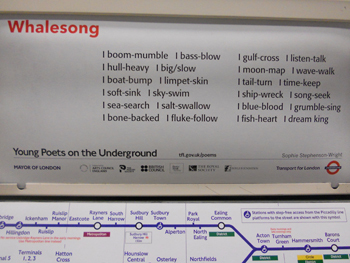 Their three poems are now showing across the tube system. Over 24 years of being crushed up against my fellow Londoners on the tube, the Poems on the Underground project (which began in 1986) has often given me a little window, with fresh air and light blowing through it, even though I’m deep underground at the time. At their best, the short poems create space for thought and wonder, or just for comedy and admiration. Read more about the Young Poets on the Underground, and/or buy a copy of the just-out paperback of Best Poems on the Underground, which is the 2010 collection. People who write usually have a room where they work, although I have at least one friend who prefers to write in cafés. 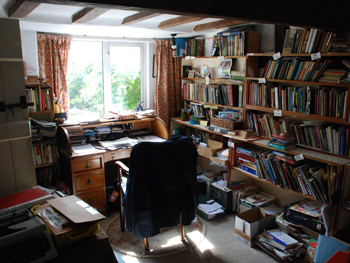 This is my father-in-law’s study, in a Warwickshire country cottage, filled with cosy, booklined shelves, pinned-up pictures, and piles of paper in a chaotic but probably quite logical filing system arranged on the carpet. The room has a lovely, quiet quality, even though it looks out onto a main road, and it’s the centre of operations for my father-in-law, who often sits in here bashing out letters on an old Remington typewriter, or packaging up snipped-out newspaper stories to post to friends, which is an endearing and lifelong habit of his. Looking at the photo makes me want to photograph these private work rooms of the people I know, and ask them to tell me about them. 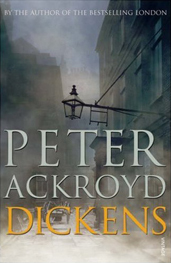 Reading Peter Ackroyd’s biography of Dickens, I’m struck by his description of how Dickens reacted to seeing his fiction in print for the first time. In 1833, Dickens (aged 21) was working as a journalist, writing reports of parliamentary debates for a London paper. But during the down time of the parliamentary recess he wrote a comedy story, his first attempt at fiction, called ‘A Dinner at Poplar Walk’ and dropped it off one night in the letterbox of a struggling magazine. In this small moment, his life turned around.